What is the CeMAP Paper 2 & 3 course? The Certificate in Mortgage Advice and Practice (CeMAP) qualification is a mark of excellence in the finance industry and highly recognised for professionals who provide advice on mortgage products and services. This industry validated certification provides you with the skills and knowledge for practical application. You can upskill from your current role or choose to become a Mortgage Advisor. Is the CeMAP Paper 2 & 3 online course right for me? Become an expert mortgage adviser and provide a vital service to home buyers. If you would like to further you career or explore the opportunities as a mortgage adviser, then this CeMAP course is right for you. After successfully passing the CeMAP qualification, you will have the choice of joining one of the many practising firms or fly solo as a self-employed independent adviser – the choice is yours! The CeMAP qualification is held by 80% of Mortgage Advisors and is considered a benchmark of success in the financial industry, which can lead to a lucrative career as a CeMAP qualified Mortgage Advisor. Why study the CeMAP Paper 2 & 3 online course with e-Careers? Gradually work through this combination course, which includes the two final papers from CeMAP courseware. Together with Paper 1 it covers all the required modules. Become a professional Mortgage Advisor, with all the skills and expertise required to join an established firm or choose to go independent. Give your CV the boost it needs, with some career-specific essential knowledge of CeMAP. e-Careers are the industry leaders when it comes to delivering this CeMAP course. What are the CeMAP Paper 2 & 3 modules? Test your understanding of the technical details to assess your ability to apply the knowledge covered. To become a professional Mortgage Advisor, you need to hold a qualification approved by the Financial Conduct Authority (FCA). 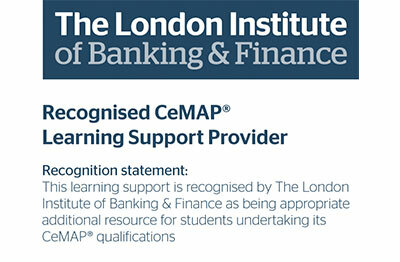 CeMAP is an FCA approved qualification awarded by The London Institute of Banking & Finance and additional fees are payable to them to sit the exams and achieve this qualification. Please get in touch if you would like to find out more about the examination process. What does the CeMAP Paper 2 & 3 online course cover? A perfect follow-up to the CeMAP Paper 1 module, this course would be ideal for anyone continuing with their studies to become a recognised and fully proficient Mortgage Advisor. This two-in-one course will help you to reach your goals in a more convenient package. Get to grips with mortgage law, practise, policy and markets. Understand the whole home buying process and the pivotal role that the mortgage adviser holds from start to finish. Also learn about mortgage products and rates, valuations and surveys and any up-to-date legislation that may be connected. Understand terms such as gazumping and gazundering, and the implications that these can have on the homebuyer. Ensure that your practices adhere to the ethical and regulatory frameworks. Hello, I am interested in your "CeMAP Paper 2 & 3 - Online".